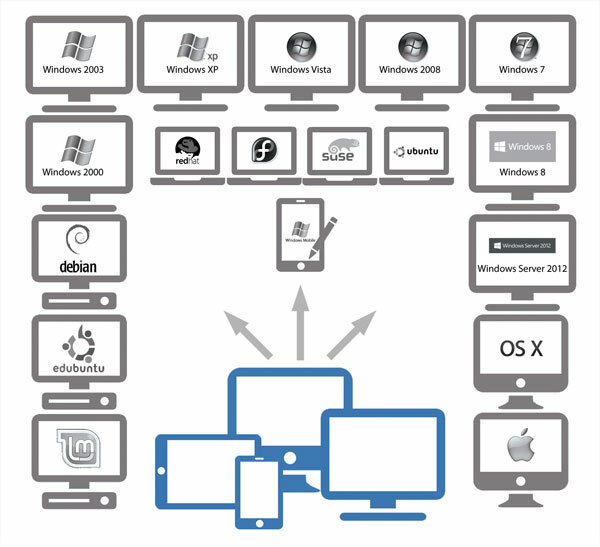 NetSupport Manager provides a range of connectivity methods to ensure devices are accessible no matter where they are located. First and foremost, NetSupport Manager requires the pre-installation of a "Client" component on any device you wish to connect to, and a "Control" component / app on any device you wish to initiate a remote control connection from. Browse and locate computers over a LAN or WAN using TCP/IP or HTTP (legacy support for IPX and NetBIOS). Store all discovered devices in a company hierarchy, use auto or manually defined groups, either locally or stored centrally. Define a range of subnets for extended network browsing capabilities locally. Connect directly to known computers by PC name, DNS name or network address. Discover and connect to any number of devices in real time across differing environments. Optimised performance for both wired and wireless connections. When you want to deliver seamless Remote Control between PCs that may be in different geographic locations and behind different firewalls, then the NetSupport Manager Communications Gateway module provides a stable and secure method for NetSupport-enabled systems to locate and communicate over HTTP. The Gateway module needs to be installed on a PC allocated with a static IP and accessible to both Control and Client PCs, even though both the Control and Client systems can be securely located behind their respective firewalls. The Gateway will only allow connections from computers using the same Gateway Security Key and is used to support staff or customers across different sites or where staff on the road need access to office resources. The Gateway is not needed for LAN/WAN-based communications. Seamless and secure remote support between secure, firewalled networks and computers. No requirement to make any changes to your existing network or firewall security. Support for up to 6,000 simultaneous Client connections per gateway. Multi-gateway redundancy removing a single point of failure for your connectivity. No dependency on an external third party service. The latest version includes a unique new PIN connect feature. In essence, a technician can locate a user anywhere across the enterprise instantly, simply by both parties entering a matching and unique PIN code. Rather than browsing to discover the user's PC and needing to know their PC Name, address details etc, the PIN process allows both parties to handshake seamlessly. The new PIN server module can run alone or alongside the Gateway module and is included as standard with NetSupport Manager. (See the "What's new in version 12" page for more details). NetSupport Manager can be configured to browse for and locate PCs that have Intel vPro capability, enabling a variety of remote tasks to be performed, even where a NetSupport Client is not installed. These include the ability to power on, power off and restart the remote machine when performing out-of-hours maintenance; view and reconfigure BIOS information; and, if necessary, boot from a remote operating system image. When plugged into AC power, the above can be performed wirelessly on a notebook system.